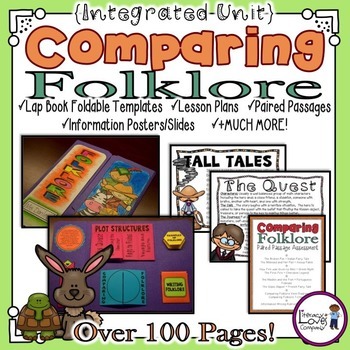 This HUGE Compare and Contrast Folklore Integrated Unit is a fun, hands-on way to teach your students to analyze folklore! Includes lesson plans, paired texts, foldable lap-book plans and templates, information posters, display ideas, and more! 100+ pages! 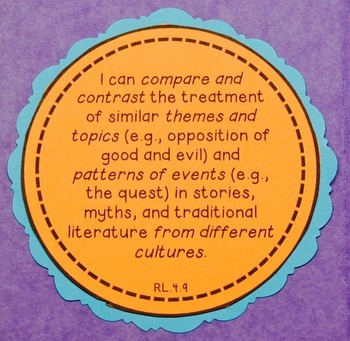 Through direct instruction, modeling, think alouds and the use of authentic text, you will teach your students the different types of folklore, dig deeper into plot structure, and instruct them on how to construct two types of compare and contrast essays. Students will work in collaborative small groups, partners, and independently to read, compare and contrast, and write folklore. 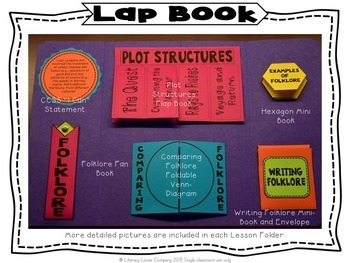 Throughout the unit, students will construct a lap book or interactive notebook to show their understanding of the lessons and keep notes and ideas. All foldable templates are provided as well as full color photographs and construction tips. Full color information posters are provided in the pdf file and also in PowerPoint slideshows. Also included are detailed lesson plans, a table of contents for each lesson, and pages are numbered for easy location and organization. 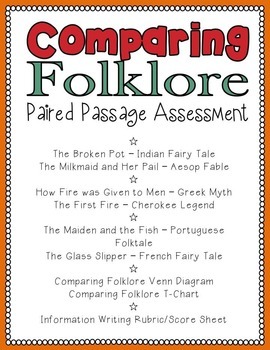 Also available in this resource are three sets of folklore paired passages. The paired texts vary in length and difficulty and suggestions are given in the file for differentiation options. These paired passages can be used for guided practice or formal assessment. This resource also includes assessment paper for both block style and point-by-point style compare and contrast essays. An Informational Writing rubric/score sheet is included. This unit not only supports CCSS RL.4.9, it also supports many other CCSS in Reading Literature and Writing. Please see preview for a list of CCSS. This comprehensive set of lessons can be used in sequence to teach a full 3-4 week reading and writing unit or it can be broken up and taught over a longer period of time to support any 4th grade ELA classroom! ★ Please take a moment to check out the preview of this item for a clearer understanding of the quality and content of the product before purchasing. It contains a complete table of contents, unit overview, and many of the over 100 pages. ♥ Thank you for considering this product! If you would like notifications about future items posted by Literacy loves Company, Please click the ”FOLLOW ME” button above. Click HERE for more CCSS resources.